Inside you will find that this restaurant in Paris has a traditional, yet elegant and refined decor with a wooden bar and the traditional brown leather chairs and crisp white tablecloths. Yet this fits in well with the old fashioned till that stands on the bar along with the old pictures portraying the cattle markets that adorn the walls, which is a constant reminder of times gone by. You will find that they do have a set menu option for individual clients, which is known as a business menu and this is a cost of €33 as of 2013. But for this cost you do get a choice of three different starters such as marinated salmon in dill, then a choice of three different main courses like tender ox cheek with carrots, followed by a cheese platter and then another choice of three different desserts like crème brulee. You also get either a half bottle of mineral water or wine and coffee to finish off your meal. However there is also an a la carte option, which also provides you with the opportunity to try one of their speciality dishes such as as the famous Angus T-Bone steak, a duck breast pan-fired in honey with celery puree or whole grilled kidney in traditional mustard sauce. When it comes to starters you could opt for a French onion soup with croutons or a chicory salad with Roquefort and walnuts, but perhaps organic poached eggs with Foie Gras or snails from the Burgundy region would be more to your liking and starters range in cost from around €7.50 up to €20. Now when it comes to the main dishes they range in cost from around €18.50 up to €75 and for those that prefer fish it could be griddled Scottish salmon with basmati rice and Bercy sauce or whole roast gilthead bream, steamed potatoes and Nantes butter from the Pays de la Loire region. 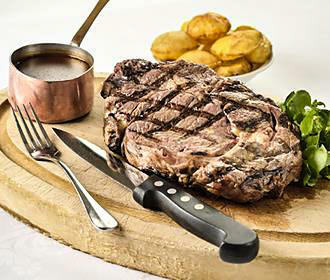 For those of you that are fond of meat, then you will find that the Au Boeuf Couronne is definitely a place to go, as you can devour a delicious piece of beef from the Normandy region such as a prime rump steak or perhaps a beef rib steak with parsley or with red wine and shallot sauce. 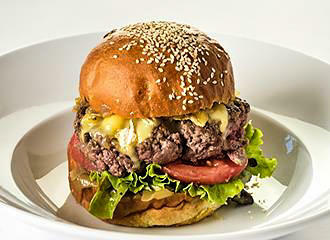 You could also opt for a beef tarter or perhaps for a more romantic meal, then choosing one of the dishes such as the Villette grilled rib of beef for two people would be more appropriate. You can then opt for a cheese course if you wish to and a cheese platter is a cost of €11 as of 2013, alternatively, you can skip this and go straight to one of the very tempting desserts that range in cost from around €8 up to €14. These could be a choice of ice creams and sorbets, or delights such as lemon cheesecake, chestnut fondant, rum baba, creme brulee, warm apple tart, profiteroles made to order and many more to tempt the taste buds. This restaurant in Paris is open seven days a week for lunch from midday to 3pm and for a sumptuous evening meal from 7pm through to midnight, and although reservations for individuals are not necessary, due to its location being close to Villette park, this is highly recommended. However, we would like to point out that if there are eight people or more in your group, then you do have to book a table in advance, but for larger groups you can also book the elegant room on the first floor for private events, and this can accommodate up to a maximum of 40 people. 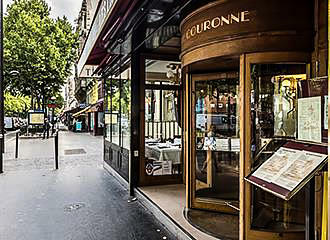 The Au Boeuf Couronne restaurant does have a valet parking service of an evening, however, if you are utilising the public transport in Paris, then the nearest Metro station is the Porte de Pantin on line 5. 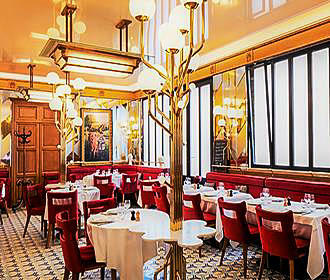 The Au Boeuf Couronne is a traditional French restaurant in Paris serving hearty portions in an elegant yet traditional restaurant that is reminiscent of times gone by when the Parc de la Villette was once the area for the Paris cattle markets and slaughterhouses. There is not much left as a reminder of how the Villette area used to be, except for the Grande Halle inside Parc de la Villette, which today has been classified as one of the historical monuments in Paris and is now home to different exhibitions and events that are held throughout the year. And even though you will not get to see butchers in their full white coats at the Au Boeuf Couronne, you will be able to enjoy the last traces of the history of the Parc de la Villette with quality cuts of meat, with of course beef being the main focus, but there are fish choices for those of you that are not meat lovers.